Optical manufacturing hub Rochester will host SPIE Optifab, the nation’s largest optical manufacturing conference and exhibition, in October. Sponsored by SPIE, the international society for optics and photonics, and cosponsored by the American Precision Optics Manufacturers Association, the biennial event draws world experts on optical coatings, metrology, materials science, additive manufacturing, lithographic processes, and other aspects of optical fabrication. 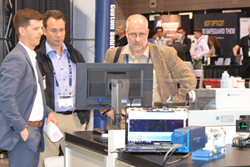 The SPIE Optifab exhibition draws keen interest from throughout the global optical manufacturing community. A record-setting 186 companies supplying tools for optical fabrication will be on hand during the three-day exhibition. Rochester, New York, center of a major optical manufacturing region and the home of the American Institute for Manufacturing Integrated Photonics (AIM Photonics), next month will host SPIE Optifab, the largest optical manufacturing conference and exhibition held in the United States. The biennial event brings together many of the world’s experts on optical coatings, metrology, materials science, additive manufacturing, lithographic processes, and other topics involved in optical fabrication. Organized by SPIE, the international society for optics and photonics, and cosponsored by the American Precision Optics Manufacturers Association (APOMA), SPIE Optifab will run 16–19 October at the Joseph A. Floreano Rochester Riverside Convention Center. Complete information is at http://www.spie.org/ofb. new developments in the optical design, manufacturing, and metrology of freeform surfaces and diffractive optics. Julie Bentley of the University of Rochester is the conference chair, and Sebastian Stoebenau of OptoTech Optikmaschinen is cochair. A record-setting 186 companies supplying positioning devices, specialty glass, lasers, and other tools for optical fabrication will be on hand during the three-day exhibition (17–19 October), offering hands-on product demonstrations and discussing fabrication needs. Large-scale equipment demonstrations will be offered by nine companies, including QED Technologies, OptiPro Systems, and Universal Photonics from the New York and Ontario region. Christian Schindler, Carl Zeiss Jena GmbH, on challenges for future serial production of freeform optics. Course topics include the proper care of optics — cleaning, handling, storage, and shipping; modern optical drawings; scratch and dig specifications; surface inspection; optical manufacturing fundamentals; and geometric dimensioning and tolerancing. Industry sessions on Wednesday will include a panel discussion addressing the impact of standards on technical and business operations, led by Allen Krisiloff, executive director of the U.S. Optics and Electro-Optics Standards Council, and a talk by Jennifer Douris O’Bryan, SPIE government affairs director, on U.S. regulations and research funding. Several companies will send hiring representatives to meet with job seekers in the SPIE Career Center Job Fair on Tuesday and Wednesday (17 and 18 October) during the exhibition (http://www.spiecareercenter.org/events/14). Among networking opportunities, Sydor Optics will present the popular annual Photonics Clambake Tuesday evening (17 October). Tickets are sold separately and space is limited (http://www.spie.org/OFB/special-events/Special-Event).